Former Blessed Feathers member Donivan Berube goes it alone on "Love Is A Dog From Hell"
The recent snowfalls and hazardous road conditions gave some Milwaukeeans a serious case of cabin fever and left many more irritated. While Southeastern Wisconsin didn’t get hit as bad as its neighbors to the north—who are dealing with the aftermath of three feet of snow—much ire was directed at what many feels is a lack of snowplowing efforts on the city of Milwaukee’s part. And, in true Milwaukee spirit, copious parking tickets were issued during what the city deemed a snow emergency. These and other frustrations about living in the Bay View neighborhood, including noisy train horns, fireworks, and dog owners failing to pick up their pet’s excrement are chronicled on the neighborhood Facebook page. Although neighborhood pages like these seem to breed and sometimes even encourage division, snark, pointless memes, and negative commentary, many Bay View residents are sick of it. Some, such as Cullen “Bubba” Folts have brought much-needed positivity to the group. He often steps away from the keyboard and takes action to help his neighbors. Folts provides a number of services for his Bay View neighbors, including yardwork, masonry, window washing, and roof repair. He does not charge set rates, but people are welcome to donate what they can afford. Several months ago, Folts posted a picture of himself on the Bay View Town Hall page wearing winter gear and holding a shovel. He stated that he was available to help with snow shoveling. Folts says he did so because several people mistook him for someone in Cudahy who was arrested for offering to shovel snow as a ploy to break into homes. Unfortunately, recent property crimes in the area have left some residents on edge and created distrust of those who simply want to help. Having worked with many contractors, some who he feels were unethical to their clients, Folts said it’s important to be honest and treat everyone with respect. “We all have the same needs,” he says. Last weekend, with a seemingly endless amount of energy, Folts shoveled countless walks and driveways for elderly residents and others who were unable to do so. 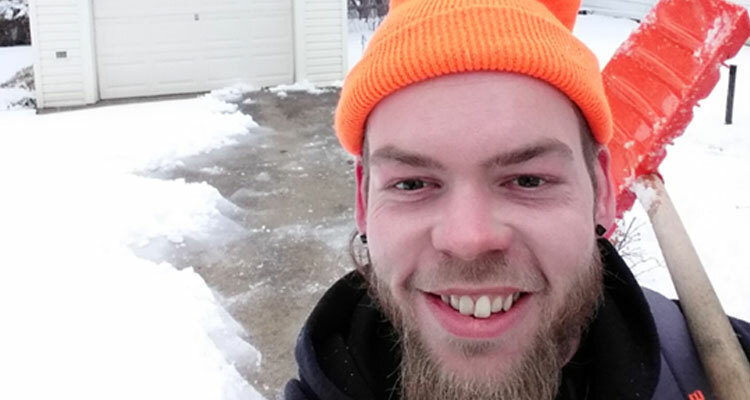 Although shoveling the heavy, wet snow that plagued the city this past Sunday would give any mortal back and shoulder aches, Folts remained cheerful and helpful—and modest. “I’m just a guy with a shovel and two feet,” he says. Folts, 31, was born in Bay View. He says as a youth, he followed the wrong crowd. Folts earned the nickname “Bubba” as a teenager, as people had difficulty pronouncing his name. When his grandmother passed away about 10 years ago, he vowed to become a better person. “I once was homeless. I know how it feels to not have help,” Folts says. Folts, a single father of a nine-year-old daughter Penelope, says he’d like to start an outreach program to provide resources for local single fathers who are struggling. He recently quit his job to pursue that and his other endeavors full-time, including helping neighbors with yardwork and home repairs, and delivering meals to the elderly. Folts is in the process of creating a Facebook page, complete with a mission statement, for his business. “I had a dark past, so I’m just trying to have a bright future,” he says. To contact Folts, call 414-762-5678. Or find him on Facebook by searching for Cullen “Bubba” Folts.